The leading professional industry membership body for dentistry in Southern Africa, the South African Dental Association (SADA) represents over 80% of registered dentists in the country’s private and public sectors. Membership is open to industry professionals from dental students to retired dentists. The association is committed and engaged in processes relating to setting industry standards and formulating policies. 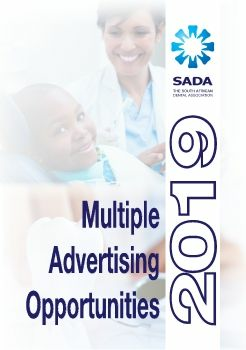 The voice for oral health care, SADA has 11 branches in all nine provinces and actively runs campaigns to educate and inform communities on issues of oral health and addresses such issues on both regional and national media platforms. The association also has various affiliate memberships for dentistry professionals in South African Development Community (SADC) member states - Angola, Botswana, the Democratic Republic of the Congo, Lesotho, Madagascar, Malawi, Mauritius, Mozambique, Namibia, Seychelles, South Africa, Swaziland, Tanzania, Zambia and Zimbabwe - as well as various other countries across the globe. Our vision is to be recognised as the trusted leader and voice of oral healthcare in Southern Africa. Our mission is to promote the interests, and serve the needs, of our members and above all encourage optimal oral healthcare for all South Africans.